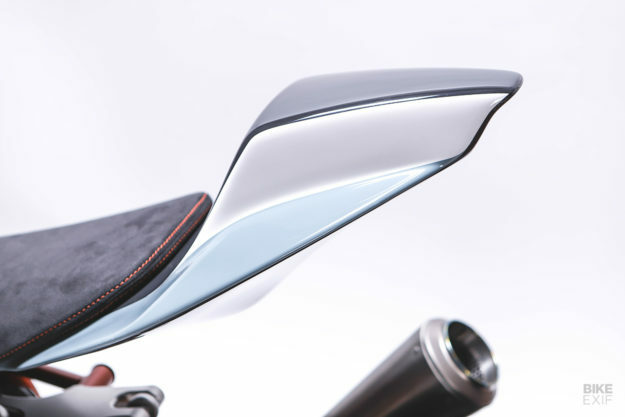 For us, the Holy Grail of bike building is mixing timeless design with modern technology. It’s easier said than done, and usually requires the full resources of a factory design team to make it work. If you want a bike with OEM levels of fit, finish and functionality, but don’t want to go down the Triumph ‘modern classics’ or BMW heritage route, Walt Siegl should be at the top of your shopping list. Walt specializes in Italian bikes, and this latest creation—the WSM ‘SBK’ #1—is one of his best yet. 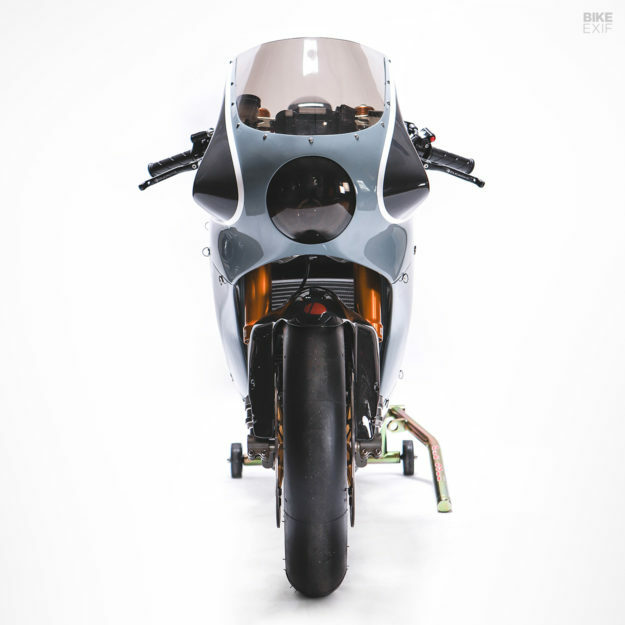 But without his workshop team of Aran, Brian and John, this superbike would never have happened—and it still took the team three long years to complete. Nicholas’ patience and trust have been well-rewarded. “His enthusiasm throughout this three-year undertaking was vital to the completion of this model,” says Walt. 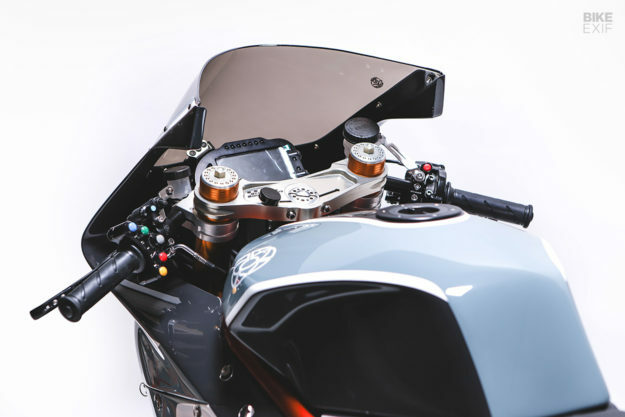 “The design of this machine is my romance with classic race bikes blending, I hope seamlessly, with modern technology and design,” he says. We think he’s got the balance exactly right, which is a relief—because an extraordinary amount of work has gone into the SBK. Walt wanted to build a Ducati superbike with a perimeter frame. 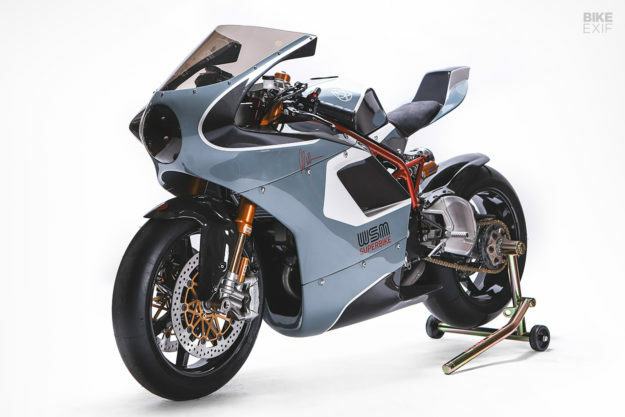 And just to complicate matters, the frame needed to accommodate two different Ducati engine configurations: the air-cooled 2-valve, and the liquid-cooled 4-valve. 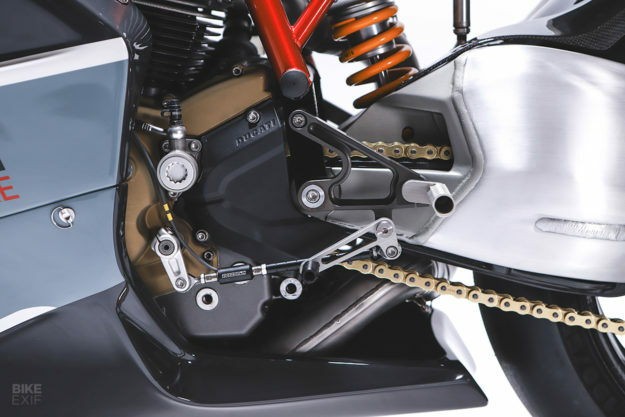 As you can imagine, the aircraft-spec chrome moly frame has involved more man-hours and brainpower than most complete custom bikes—but it’s given Walt a solid foundation for future superbike builds. 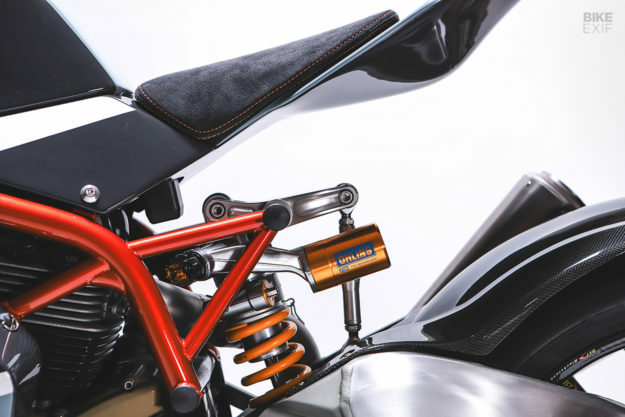 Most bikes have a steel subframe with a separate seat and tail section, but the subframe and tail here are one unit—made out of structural carbon fiber and weighing, unpainted, 1.8 pounds. That’s just over 800 grams. The machine shown here has 2-valve power, but this is no off-the-shelf motor. Walt surrounds himself with a team of like-minded, perfectionist collaborators. 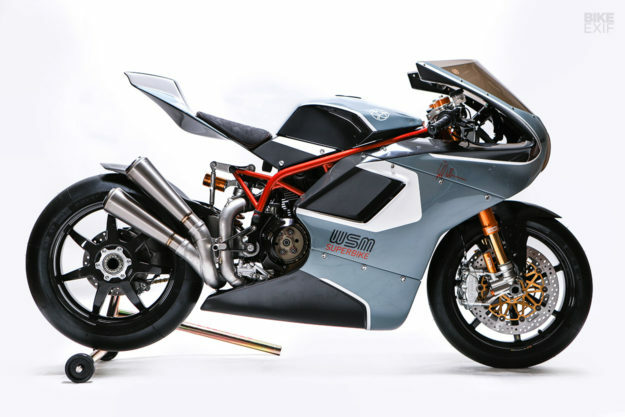 So the motor was built by Bruce Meyers Performance, one of the best Ducati engine builders in the States if not the world. The bottom end is from a 4-valve 1098, balanced and lightened with a polished, stainless crank. 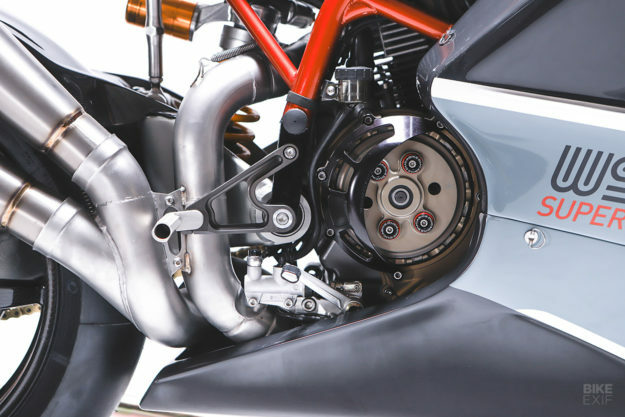 The exhaust headers are custom-made from stainless steel, and terminate with a pair of very sleek titanium mufflers from Arrow. Walt’s designed the airbox (and the intake tubes hidden inside the fairing) to save weight, as well as maximize flow. So they’re crafted from carbon fiber, instead of injection-molded plastic, and the floor of the tank functions as a lid for the airbox. 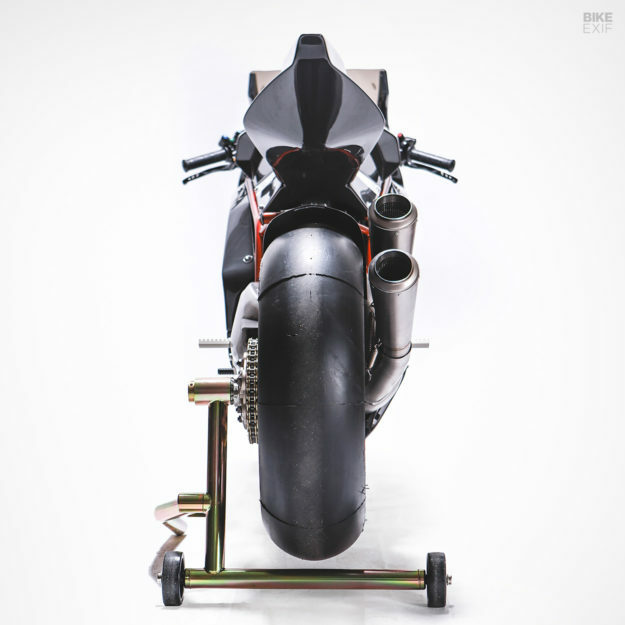 It helps keep the weight of the superbike down to a remarkable 340 pounds (155 kilos). 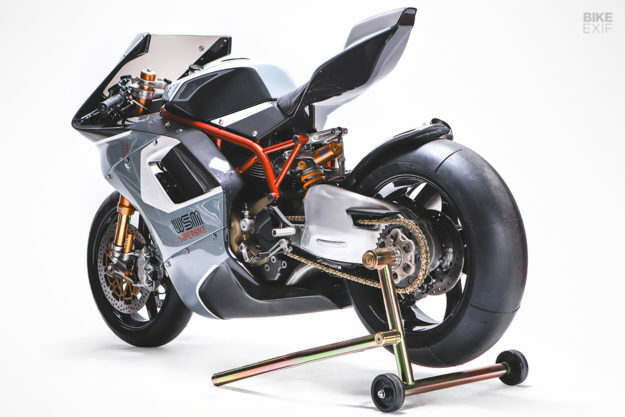 That’s fractionally lighter than Ducati’s current MotoGP bike and about 24 pounds (10 kilos) lighter than even the 1098 R showroom bike. Custom electronics keep the engine in the sweet spot. 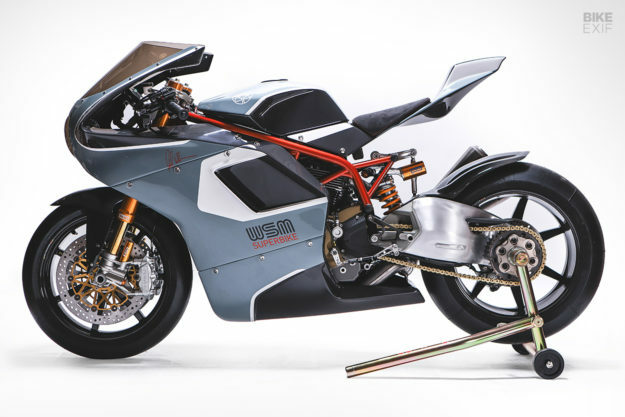 There’s a Ducati ECU, but with WSM-specific programming, hooked up to a race-style wiring harness. 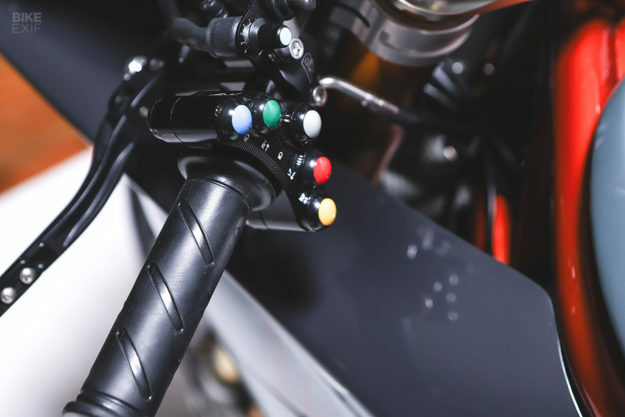 Modern niceties such as traction control, and clutchless quickshifting are all present and correct, and track riders will enjoy the data acquisition system. There is no risk of the power overwhelming the chassis. 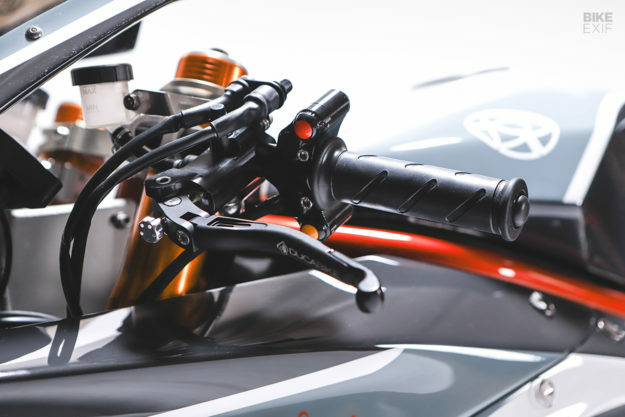 The suspension is Öhlins at both ends: FGR World Superbike-spec forks, a TTX shock built to Walt’s own specs, and a Ducati 1098 swingarm. The brake system includes Brembo monobloc calipers, Brembo 330mm front rotors, and Spiegler Performance lines. The master cylinders are from Ducabike, and the wheels are carbon fiber Blackstone Tek items, shod with Metzeler slicks on this bike. Even repeated braking at the end of the Mugello straight wouldn’t phase this superbike-style setup. 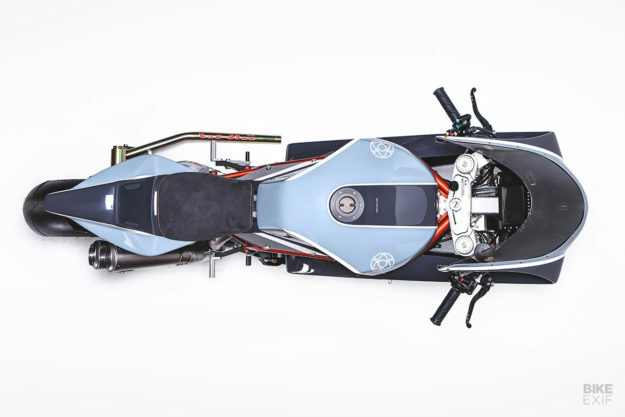 It’s all wrapped in beautiful bodywork shaped by the Vermont-based company Green State Carbon, fixed to the bike with aluminum stays and topped off with a custom windscreen by Gustafsson Plastics. 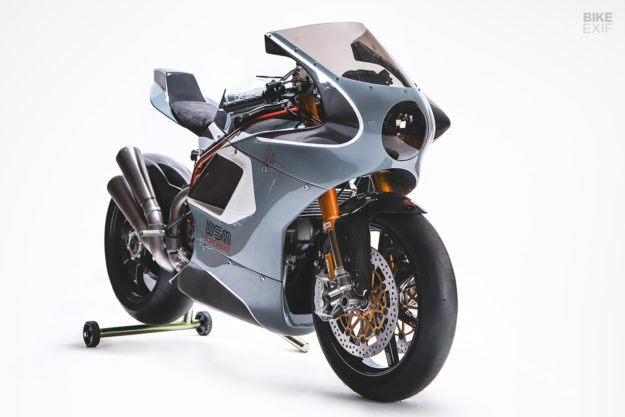 It weighs just nine pounds, thanks to the carbon fiber construction, and is finished in a simple livery designed by the client Nicholas with help from Paulo Rosas of Speed Machines Design. The lustrous blue-and-white paint was shot by regular WSM partner Peach Pit. ‘SBK #1’ reinforces Walt’s standing in the premier league of custom building. 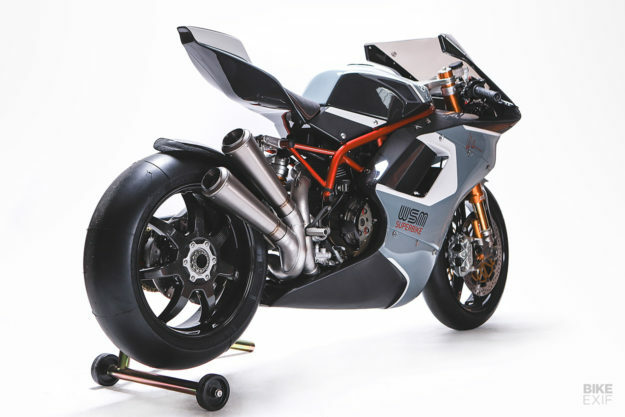 And it’s sure to pique the interest of anyone with a taste for Italian superbikes. Time to buy that lottery ticket, perhaps?